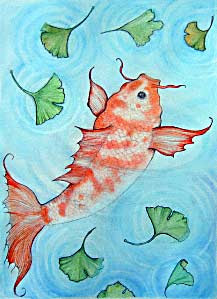 "This is a watercolor (ed.Cor) of a Koi, in a pool with my favorite leaf, design-wise, the ginkgo. All I know right now is that this koi is going to be bright orange, with spots of some kind, which I think will contrast nicely with the blue of the water, and the green & gold of the ginkgo leaves. " You can read about the process here, also click on this watercolor there to see an enlargement.